If your mobile devices are aging, as mine are, the battery life just isn’t what it used to be. This isn’t a problem when stationary because you can plug into an outlet. This also isn’t a problem when traveling by car, train, or, increasingly, by plane because you can plug into the vehicle’s power source. But when traveling by foot as I have done for much of this trip, I have been very thankful for my back-up batteries. IntoCircuit Power Mini (pictured) (currently $12.99 at Amazon) was the first one I bought. It will give me two or so full charges to my phone battery. Connect one end of a USB cable into the battery and the other end to your mobile device. When you want to charge your back-up battery, plug it into an outlet or your computer. Oh. And it also works as a flashlight. After a recent trip, I couldn’t find my IntoCircuit battery thus thought I had lost it, so when I saw the RandomOrder Power Bank (pictured) on a recent Costco run, I picked it up; they were packaged in pairs. This battery and the IntoCircuit battery use identical cases, although the IntoCircuit battery carries a bit more oomph under the hood. Unfortunately I promptly dropped one of the two RandomOrder batteries rendering it inoperable. But then my IntoCircuit battery magically reappeared in my backpack. I just checked the Costco website, and I’m not seeing it in stock there. You can, however, purchase the 2-pack from Amazon for $19.99. If you’re charging your mobile devices, you have USB cables. I use two different cord wranglers. For my longer cables, I use the medium Bobino cord wrap (pictured). You can get a 3-pack for $7.95. For my shorter cables, I use Nite Ize 3-inch gear ties, available in a 4-pack from Amazon for $2.98. (Not pictured because I was out Geocaching, and I lost the only one I had with me. I have more at home, though. Or if I go buy more, it will apparently reappear.) Your hardware store probably also carries them. Look wherever they display the bungee cords. When I have to hole up in a coffee shop or some other public space, I don’t want to have pack up all my stuff just to get a coffee refill or run to the restroom. (Which of these I do, of course, depends on where I am in the input/output cycle.) 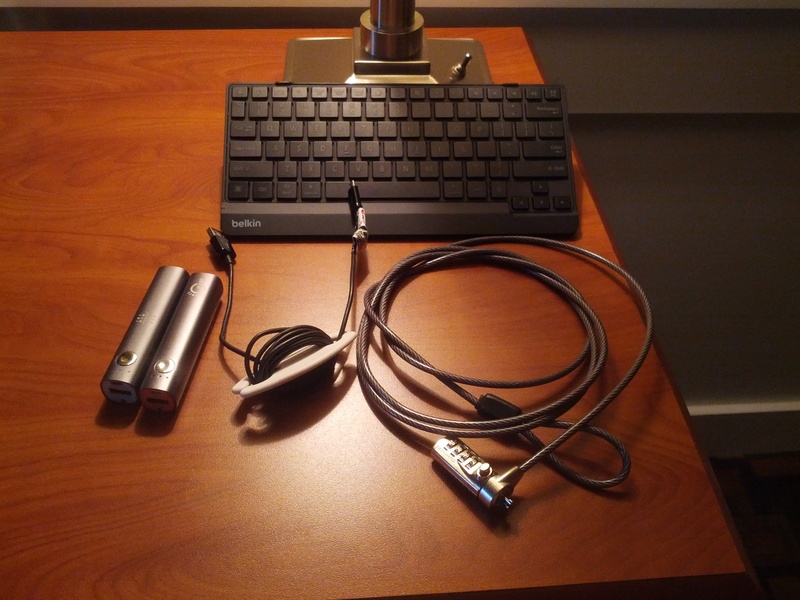 I use a Targus Defcon CL laptop cable, available for various prices at Amazon (pictured). Also check out this review of laptop locks. It’s a couple years old, but the information is still good. The cables all work pretty much the same way. Put the cable around a table support or some other immovable or not-easily-movable structure. Thread the lock through the loop (and your backpack and anything else you don’t want to walk off) and attach the lock to the back of your laptop. I wouldn’t leave my stuff for hours this way, but it’s unlikely that someone will, while you’re in the restroom, run into the coffee shop with cable cutters. On a trip a couple years ago, as I was walking to the departure gate of my hometown airport, it occurred to me that my backpack felt suspiciously light. Upon inspection I discovered that I had managed to pack my laptop charging cord but not the laptop itself. I did have my tablet (and phone) so I had ready access to all of my files (let’s pause a moment to appreciate how cloud storage has changed our lives), but I wasn’t looking forward to spending two days in meetings without a keyboard. I don’t mind swiping the on-screen keyboard for a quick email, text, or search. But for extensive document editing? No thank you. Typically I do extensive research on a product before I purchase it. In this case, my research consisted of finding an electronics store in my connection airport that had a Bluetooth keyboard. Fortunately it was Minneapolis, which is one big mall that happens to have airline service. My only option was Belkin; you can get it for under $50. I couldn’t, but you can. I like that the keyboard is free-standing so I can position it wherever I’d like in relation to my tablet. That’s especially nice in cramped spaces. I had been using a cheap rubber-tipped stylus on my tablet (3 for a dollar, or some such thing) that worked well once it was nice and broken in. 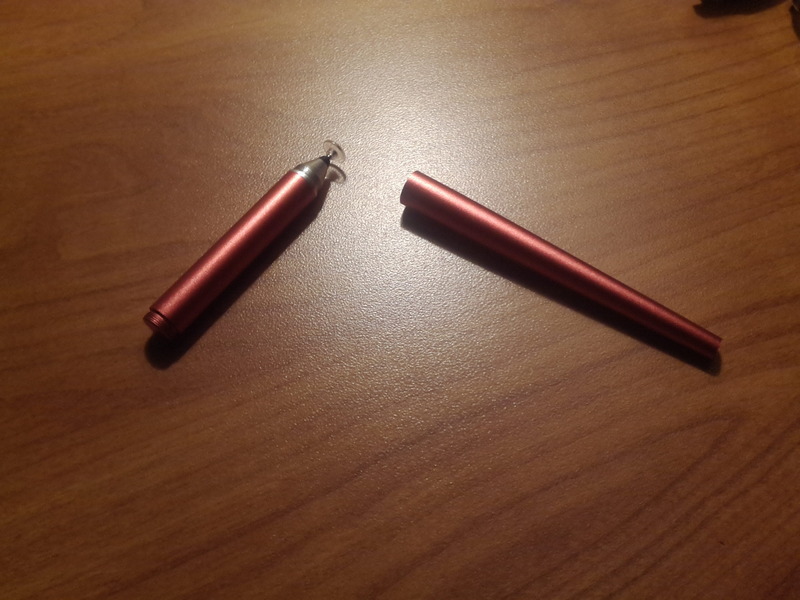 When it was just plain broken (the rubber tip developed a tear), I pulled out its sister stylus from the pack. I was surprised by its stiffness and how hard I had to work to get it to work. I was not prepared to put in the hours that were evidently necessary to break it in. Besides, it’s been a couple years, surely there is something better out there. This is the Musemee Notier stylus (pictured), available from Amazon for $16.99. My tablet is very responsive to the clear rubber disk. The stylus produces a harder sound when tapping the tablet surface than did my well-worn rubber-tipped stylus, but I suspect that has more to do with me than the stylus. I was accustomed to a firmer touch, so I’m still getting used to not having to tap so hard. If you’re looking for more things you didn’t know that you absolutely needed, search LifeHacker for go bag. Start with this article. 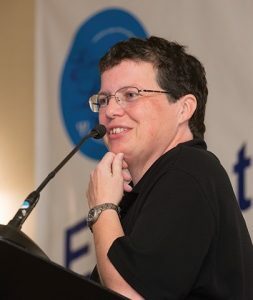 A Grid It organizer. It’s just a firm backing with interwoven elastic bands. Tuck your gear under the bands and toss it in your bag. It will keep things like back up batteries from getting lost and USB cables from getting tangled. What’s in your go bag? Doing well, Merimobile. You really provide best smartphones and mobile accessories. Keep it up.